I'm starting my Christmas shopping list now and I have to say that it's not going to be an easy task. I need to find new gift ideas for this year so that the recipient will not get the same gift as last year. I also hate last minute shopping so I might as well shop from time to time especially that some malls are having their sales already. 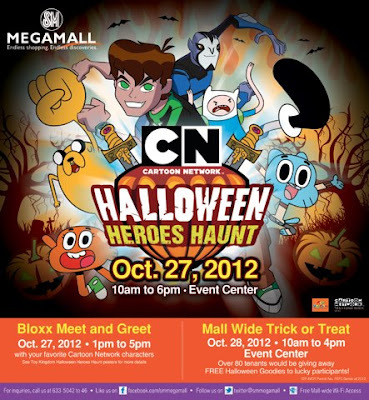 Head to SM Megamall on Oct. 27 and 28, 2012 with your kids for this exciting Halloween events. There's also mall-wide trick-or-treating that will happen! I first heard about this Human Heart Nature products from my SIL, who happens to be a direct seller of this product. She’s been encouraging me to use it but I didn’t care much on what she is saying as I thought it was just another so-so product. When my friends started using them and giving good reviews, then that is the only time that I was encouraged to try them last May. These are the first few products that I ordered from my sister in law and so far I’m loving the products. Pro-Philippines – bec. they use ingredients that are grown here in the Phils. Pro-Poor – they partnered with gawad Kalinga and other organizations to help farmers. Pro-Environment- their ingredients are all natural and organic. Products are 100% free of harmful ingredients. Bead bracelets as fashion accessories have long been used by both men and women. They can accentuate any outfit by wearing one bracelet or many bracelets at the same time. Many of the bead bracelets that you can purchase are made of different materials like glass, plastic or crystal beads. If you are creative, you can buy your own materials and make your own bead bracelets depending on your taste. You can use it, give as gifts or sell them if you want. Here are some bead bracelets that I want to have. The SALE sign is up once again! Expect heavy traffic once again when SM Megamall will have their Mega 3-Day Sale on October 19-21, 2012! There will be up to 70% off on many items and I'm sure you shopaholics don't like to miss this. Christmas is fast approaching so this is also a chance to buy some gifts at discounted prices. Choosing the right kind of gifts to anyone can be a little daunting most especially when you run out of ideas what to give. These days, personalized items are very much in demand and are always perfect gifts to give. For sports enthusiasts or fanatics, nothing can be more great than giving them sports related gifts such as jersey, balls, or any stuff that will show their chosen sport. You can give basketball with photos or football gift with signatures or logo of your team. They will become great collectibles as well. 'm looking for a new perfume to buy for my birthday next month andI'd love to try the DOT fragrance by Marc Jabobs. Dot carries a lush, effervescent floral scent perfect for every eclectic, spontaneous female. Features top notes of red berries, mid notes of jasmine and base notes of driftwood for a bold, feminine scent. The packaging channels Marc’s energetic polka dot pattern, with our signature over-sized cap.